The first time I visited Japan, I was given a box of apple juice on the train. (It was an organized work trip…I did not accept apple juice from a stranger.) I was thirsty, so I accepted the juice even though apple is right down there with grape as my least favorite fruit juices. To my surprise, the apple juice was amazing. I mean, it was so good that I spent the rest of my trip seeking out boxes of it in every vending machine on the streets. What makes it so good, you might be asking? It actually tastes like an apple, slightly tart and perfectly crisp. It is almost color-less and it is made with red and green apples (who would have thought?!) to give it that perfect balance of taste. I live in America, home to apple pies, apple crisp, apple turnovers, apple fritters, Johnny Appleseed, apple farms, apple picking…how can we be so wrong about apple juice? 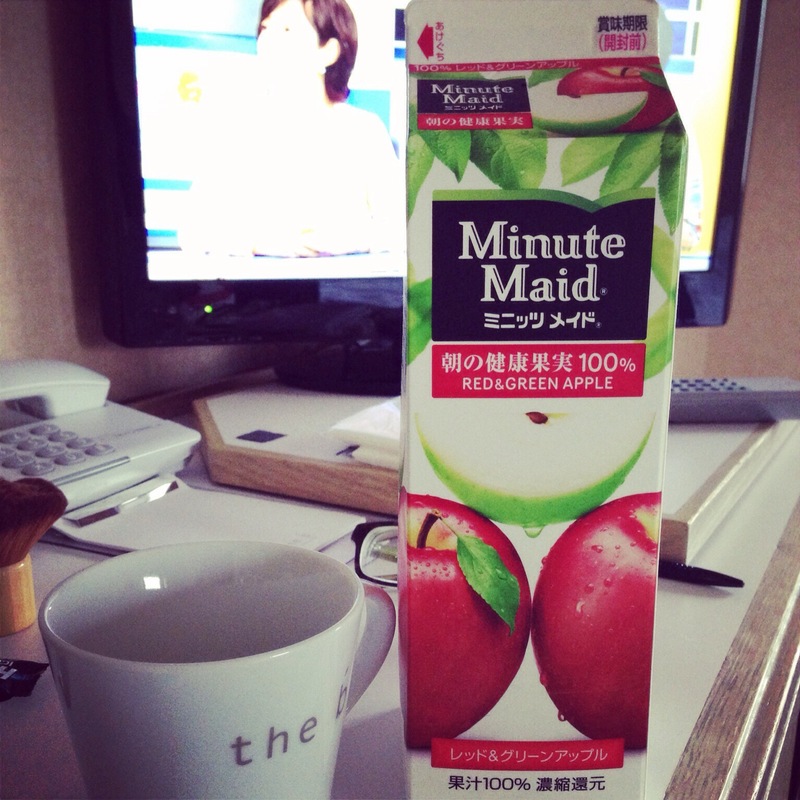 I actually emailed Minute Maid to ask where I could find the red/green apple juice blend at home. They told me that their products are developed for the tastes of a particular country…I guess I’m in the minority in the US? Crisp, refreshing apple juice…another reason Japan Does It Better! Hope you enjoy a refreshing glass for your birthday. Isn’t it terrible to crave something that you just can’t have! I feel your pain, Shynell!! Yes!! I was just in Japan in January, and their apple juice was heavenly. If you figure out how to purchase it in the U.S., please let me know!!! I totally agree with you. The first time I had apple juice in Japan I was shocked! It wasn’t the amber color I was used to seeing here in the States but more like the juice when you bite into an apple. Another thing Japan does better is milk. Being lactose intolerant, I have to drink almond milk. In Japan however, I was able to drink whole milk without a single issue. I had cereal every morning and it was great! Perfect description, “like the juice when you bite into an apple.” It’s exactly that! I didn’t drink any milk while I was in Japan but now I’m going to have to try it. I wonder if they process it differently since the Japanese don’t tolerate dairy well? That’s awesome! You’d think Minute Maid used the same trade secrets no matter the country!